- Publisher Leaving a pastorate is hard on both congregation and pastor. Learn how to make this transition a growth experience for all. Written for congregations and pastors, Goodbye skillfully weaves accounts from clergy, laity, and educators of seven denominations with White's own insight as a former General Presbyter to create a resource for meaningful and healthy partings. Includes examples of a "farewell" worship service and litany for closure of a ministry. - Publisher Leaving a pastorate is hard on both congregation and pastor. Learn how to make this transition a growth experience for all. 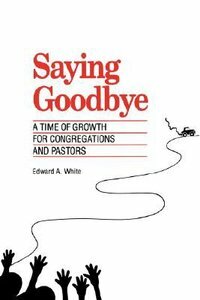 Written for congregations and pastors, Saying Goodbye skillfully weaves accounts from clergy, laity, and educators of seven denominations with White's own insight as a former General Presbyter to create a resource for meaningful and healthy partings. Includes examples of a "farewell" worship service and litany for closure of a ministry. About "Saying Goodbye Time of Growth"
Leaving a pastorate is hard on both congregation and pastor. Learn how to make this transition a growth experience for all. Written for congregations and pastors, Goodbye skillfully weaves accounts from clergy, laity, and educators of seven denominations with White's own insight as a former General Presbyter to create a resource for meaningful and healthy partings. Includes examples of a "farewell" worship service and litany for closure of a ministry.